Zewiditu is a jewelry designer, model, artist, poet, actress, designer, student, community activist and vocal artist- an all around inspiring young woman from Washington D.C. based in New York. As you see, her work transcends beyond what the eye can see, and has an essence of freedom and expression that are intrinsic in her design style. Nyne‘s jewelry is a beautiful elegant yet gritty form of self expression. Drawing her inspiration from African and Native American tribes, her pieces have a very visceral, yet far from overbearing spirit to them, with a flair and air akin to nature and true spirit and identity. She focuses on nose chains, rings, and unique adornment. Nyne actually came into jewelry design by happenstance. 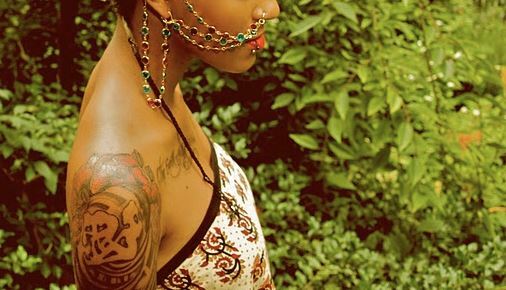 She originally wore nose rings and chains (her mother designed her first one), but when she lost one of hers, she was inspired to make her own, and as the compliments then clientele grew, so did Nyne Lyves. She creates inspirational, eclectic and hipsy (the hipster / gypsy style ;-p) pieces. Learning more about Zewiditu was truly a great experience for us at AurumEve. As we learned, Zewiditu is also an avid volunteer, and has created A Tea Takeover: Influential Women on the Brink of Brilliance , in which the mission is to erase the disconnect between education and the arts, specifically in New York City, by providing a bridge for students to connect in a positively charged atmosphere to impact youth in a positive, motivating way. All images courtesy of Nyne Lyves. Great blog! I look forward to having a good gander in following you. Not only do I agree, but you have the best comments….EVER <3!